Hello Kitty Japan is located on the 2nd floor of Diver City. 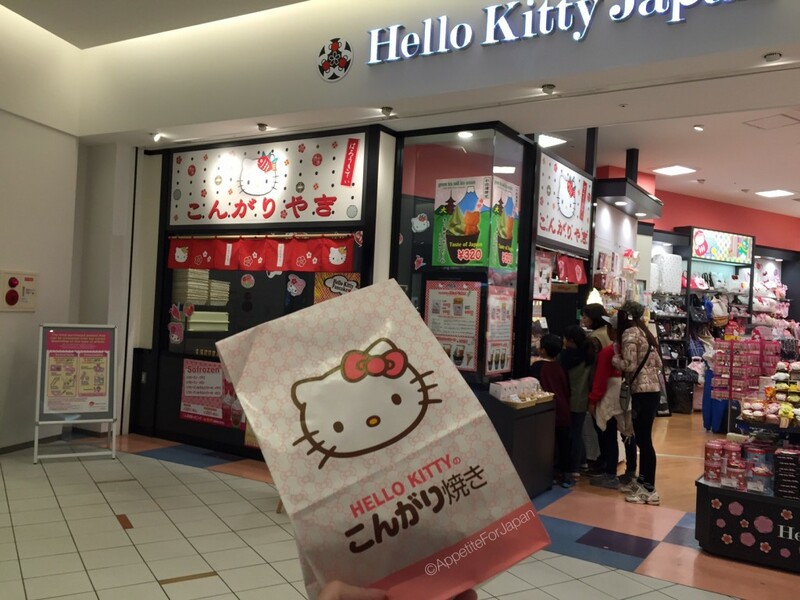 It’s hard to miss all the pink, not to mention the large Hello Kitty dressed in a kimono toward the front of the store. 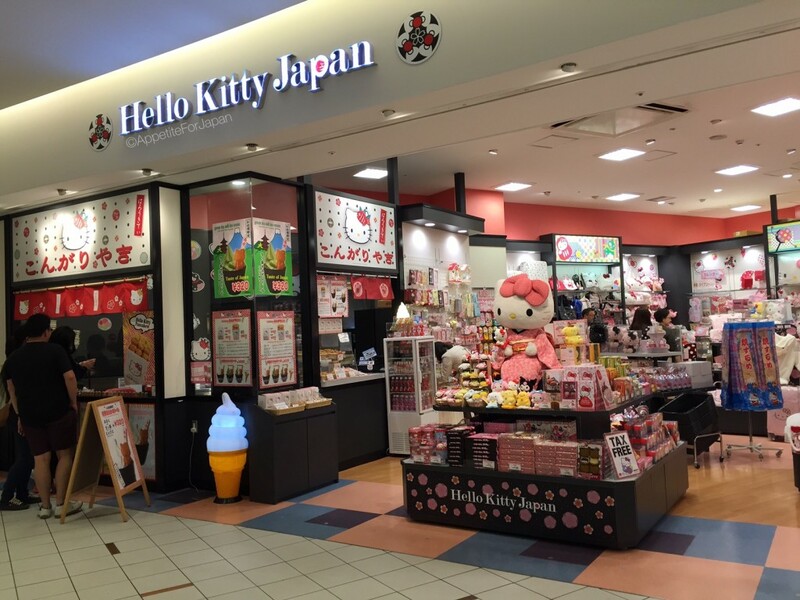 In the main part of the shop, you can find a range of Sanrio goods from Japanese themed Hello Kitty treats to Hello Kitty, My Melody and other Sanrio related merchandise. The mini Hello Kitty pancakes – also known as Hello Kitty hotcakes – are made and sold just to the left of the Hello Kitty shop. The pancake batter is poured into the little Hello Kitty shaped moulds to create little 3D Hello Kitty treats. I can imagine that these would be nice if freshly cooked and still warm. However, they sell them at room temperature and say that they’re baked daily. You can also order these with soft-serve ice-cream. 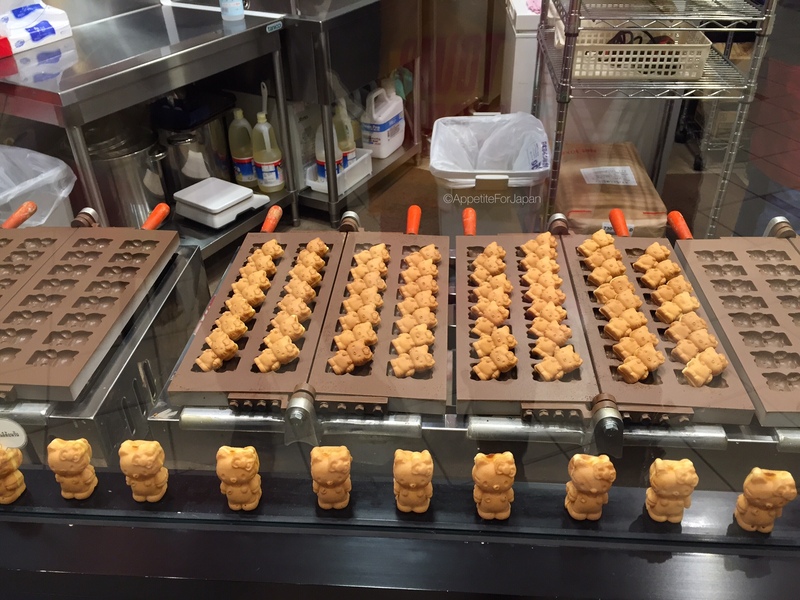 Above: The Hello Kitty mini pancake moulds. These ones appear to be for show, as they weren’t cooking any while we visited. They say to eat them the same day that you purchase them. We ordered 10 pancakes in a mix of all four flavours, which cost 400 Yen. 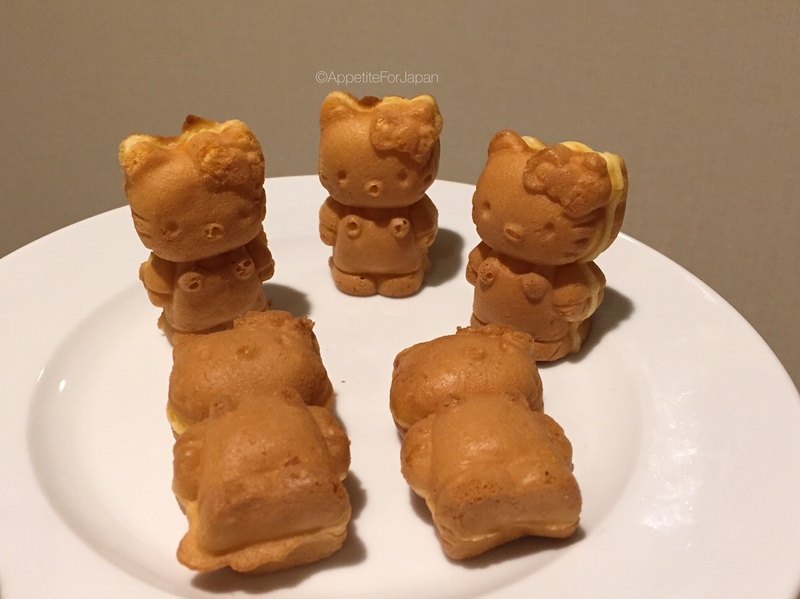 We’d eaten so much already – including breakfast at the other Sanrio themed eatery in Diver City, Cafe de Miki with Hello Kitty – that we decided to take the Hello Kitty mini pancakes home to our hotel room to eat that evening. 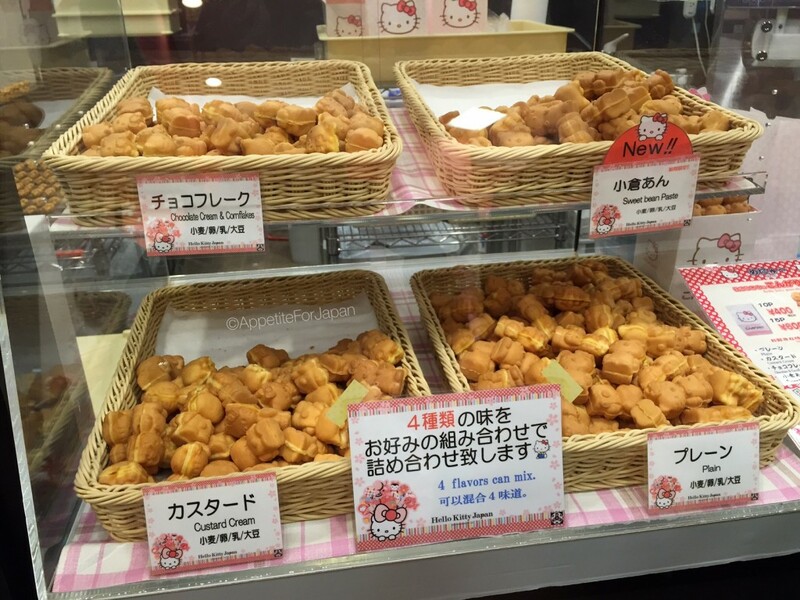 Above: The Hello Kitty hotcakes taste like pikelets (which are kind of like small pancakes). They don’t have much flavour, and even the ones with flavoured filling (such as chocolate cream) are fairly bland. All in all, we thought the mini Hello Kitty pancakes were pretty average. They would no doubt be much better served hot, but sadly that’s not how they sell them. Still, these are a good option if you’re really keen on eating some kind of Hello Kitty themed treat without sitting down at a Hello Kitty cafe for a full meal, and they’ve got a bit of the kawaii factor. 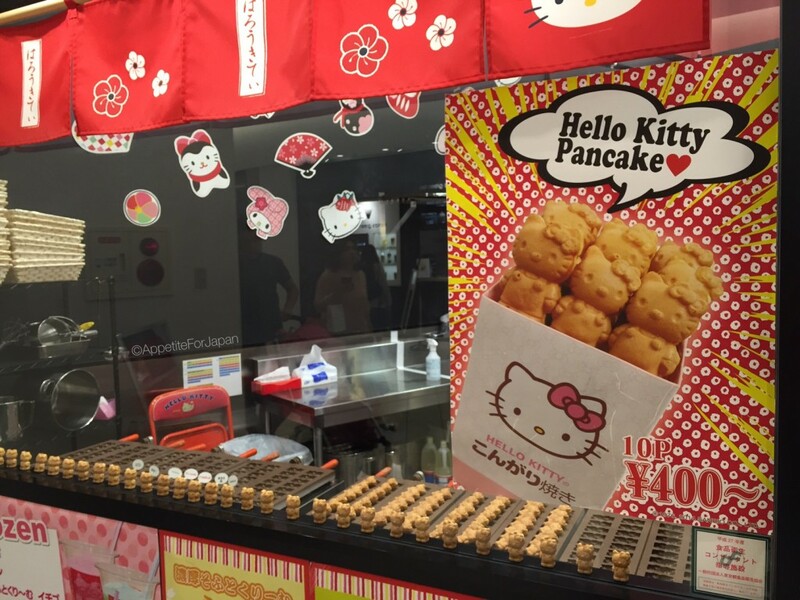 If you’re after more substantial and much tastier Hello Kitty pancakes, click here to read about Cafe de Miki with Hello Kitty – it’s located in the same shopping centre and has some of the nicest pancakes I’ve ever eaten.